Australia could end up paying around US$172 million for each of the seven planned MQ-4C Triton unmanned surveillance aircraft and around US$37 million for each Next Generation Jammer pod to properly equip the RAAF’s fleet of 12 EA-18G Growler electronic warfare aircraft. A new report on the US defence budget gives an insight into what Washington is paying for new equipment, some of which Australia is also planning to acquire. The report was prepared by the independent Center for Strategic and Budgetary Assessments CSBA) in Washington and details the status, plans, procurement quantities and funding requirements for each major defence capability being acquired by the US military. It also covers new capabilities that Australia won’t be acquiring, such as the B-21 Raider bomber (US$564 million per aircraft) and Ground Based Strategic Deterrent, the replacement for the Minuteman III ICBM. 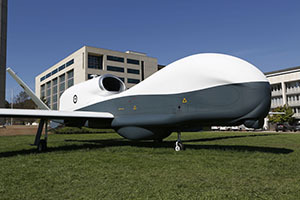 Australia is looking to acquire Triton as an unmanned broad area maritime surveillance capability and likely also the MQ-9 Reaper, a surveillance UAV with the capability to conduct strike missions. The US is spending big on Triton. The report says a total of US$5.84 billion has been appropriated through FY 2017, $4.19 billion was requested for the FY 2018 and $6.85 billion beyond, to acquire 70 platforms. That gives an estimated average procurement unit cost (APUC) of US$171.78 million. Prices could come down as plenty of other nations are interested in acquiring Triton, including Germany, Canada, Japan, Norway and the UK. Only last week, Australia and the US signed a memorandum of understanding for development of the Next Generation Jammer, which will give US Navy and RAAF Growlers an advanced electronic warfare capability. The report says NGJs will have greater capability to suppress newer and more numerous adversary air defence radars and communications systems. Its open architecture will facilitate future upgrades to keep pace with emerging challenges. Major testing only started this year on four test systems. The program anticipates 131 production units with initial operating capability expected in 2021-22. Future upgrades to extend capability are already planned. CSBA says approximately US$1.84 billion has been appropriated through FY 2017 for this program, with an additional US$3.31 billion requested for FY 2018 and US$3.33 billion for beyond FY 2022. Each pod is estimated to cost US$37.32 million. The report also discusses the F-35 Lightning Joint Strike Fighter, which it says is currently the largest ongoing acquisition program and among the most expensive in Department of Defense history, around US$1.12 trillion over an estimated service life of 30 years per aircraft. Around US$110.52 billion has been appropriated through FY 2017. That’s more than triple Australia’s entire defence budget. It says the F-35 program has faced challenges since its inception and has been restructured three times, the most recent in 2011 resulting in costs being significantly reined in. But ongoing software development remains a risk to the development schedule. It puts average unit cost at US$140.96 million per aircraft. That appears to be for all three variants, with the Navy and short takeoff and vertical landing (STOVL) versions both more expensive than the conventional takeoff and landing F-35A version Australia is buying. Earlier this year, the head of the F-35 program in the Pentagon General Chris Bogdan cited a target cost of US$85 million per F-35A at peak production.